Tented projects allow companies to work through winter weather and retain their talent during the off-season. Davis Landscape Co. shares an example of the finished project. At Greencare Landscape Management, the work doesn’t stop just because it’s winter. Instead, crews at the Scarborough, Maine-based company pitch a tent on the client’s property and keep on going. Jeffrey Chakirelis says this approach to working through the elements helps keep revenue flowing during the off-season, prevents employee layoffs and helps the company get a head start on spring projects. Greencare Landscape Management is a $2 million to $3 million company that offers 70 percent design/build and 30 percent maintenance services to an 80 percent residential, 20 percent commercial clientele. Chakirelis says the process of tenting winter projects has allowed the company to extend the working season, alleviate any fall backlog, and keep its skilled stonemasons on staff year-round. Most of the company’s winter projects involve stonework that can be done under the defined space of the tent, such as building masonry walls, fireplaces and outdoor kitchens. Bigger jobs, such as laying pavers and constructing patios, are too large to cover with a tent, Chakirelis says. The company plans ahead and prepares for its winter projects by laying the concrete bases during warmer weather and covering them with thermal blankets to protect them from frost until the stonework begins. Each winter, the company has two to three tented jobs going at any given time. But these jobs have to meet certain criteria to be worth the extra effort involved with tented work, Chakirelis says. Most of Greencare’s winter projects are worth $10,000 or more. The location also has to be conducive to erecting the tent and accessible to crews and machinery. For example, Chakirelis says a job right on the lakefront in the middle of winter would likely have too many variables to be considered for a tent, and he would advise that client to wait until spring. “The margins are as good as doing the job in the summer, but the idea is to keep everyone busy, keep our core people and have another source of revenue during the winter,” Chakirelis says, adding that the company also does nontented projects during the winter, such as installing indoor fireplaces. Greencare Landscape Management owns its tents, which are made of a special plastic that absorbs sunlight and retains heat. Chakirelis says it takes three guys about half a day to erect a tent using the company’s systematic approach to building the frame, which involves creating gables at each end to allow snow and rain to roll off. As long as the tents are set up, taken down and stored properly, they typically last about three seasons. Crews also add two portable kerosene torpedo heaters inside each tent to keep workers warm and to keep materials at an even, controlled temperature. Depending on the size of the tent, Chakirelis says the company usually adds 5 percent to the cost of the project. Because of the extra costs associated with winter projects, Chakirelis says most clients are willing to wait until spring to get started. Eager clients are often sold on the idea of having the bulk of their project completed during the winter months, he says, so they can begin to enjoy their new outdoor space as soon as the weather breaks. Davis Landscape Co. in Lisbon, Maine, also uses tents to work through winter. Gary Booker, the company’s hardscapes manager, has worked as a mason for nearly 40 years and brought the process with him when he came to Davis Landscape 20 years ago. The full-service company, which has a half residential, half commercial clientele, doesn’t seek out this kind of winter work, but it will do it for the right clients when necessary. 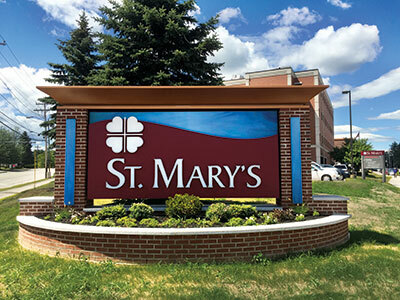 For example, a regional medical center needed a stone sign installed and invoiced before the end of 2015 for budgetary reasons, so Booker and his crews tented the project and worked through the elements to complete it on time. Booker says a tent can add about three days to a project, so Davis Landscape adds an extra 10-20 percent to the cost of tented jobs, which require heating the tent’s interior to 40 degrees F, the minimum temperature required when working with mortar. The company also charges clients for the costs of renting the portable heaters and providing the heat. Because of these upcharges, Booker says most of the company’s tented jobs are done for residential customers who can afford the extra fees and are anxious to have their projects completed. Commercial customers, on the other hand, are typically working with set budgets. Booker says contractors who are considering tented work should take the time to carefully estimate the job to ensure it’s profitable. He also says winter work isn’t for everyone. A lot of his guys look forward to a little time off at the end of the year to rejuvenate themselves for the busy spring season. Those who are interested in working through the winter also have the option to help Davis Landscape’s owner renovate houses, which Booker says can be a more dependable source of income than relying on landscape design/build work during the winter.